Welcome to the official blog of NYU's Division of Libraries. 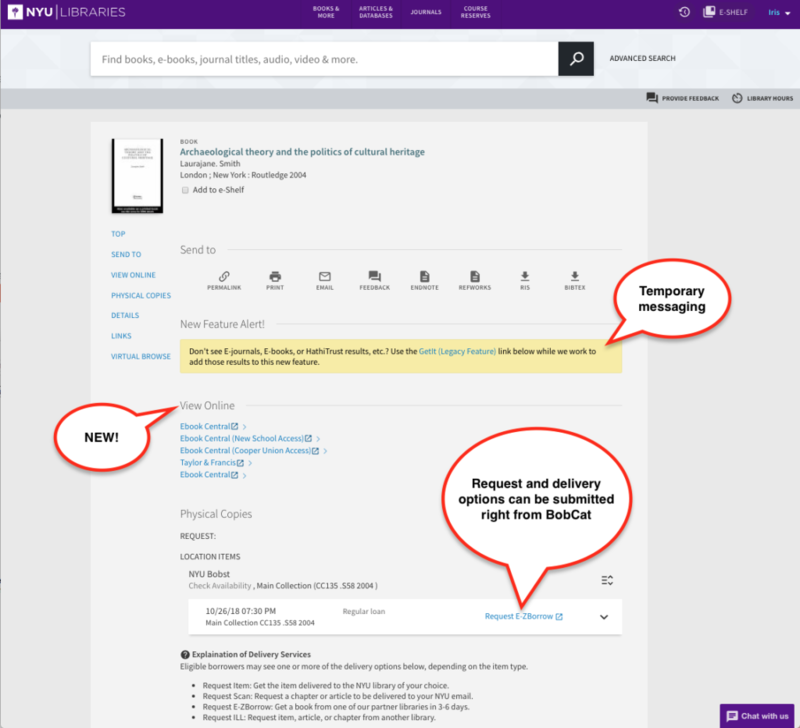 The NYU Libraries regularly acquires new databases. Take a look at the new database we added to our collection in February 2019. Bloomsbury Applied Visual Arts is a comprehensive visual arts education guide and resource that offers searchable access to books which combine visual inspiration with practical advice on idea generation, research techniques, portfolio development and more, across the main visual arts disciplines. Bloomsbury Architecture Library is a resource for the study of architecture, urbanism, and interior design. The platform offers access to a curated collection of fully-searchable text and image content, incorporating the new edition of Sir Banister Fletcher’s Global History of Architecture, exclusive to the platform, alongside peer-reviewed academic research and a wealth of images. Bloomsbury Cultural History is an interactive online resource providing digital access to Bloomsbury’s Cultural Histories series. Made up of curated and illustrated reference works alongside eBook and image collections, Bloomsbury Cultural History presents content within a single, fully cross-searchable platform. Dictionary of Old English: A to I (DOE) defines the vocabulary of the first six centuries (C.E. 600-1150) of the English language, using twenty-first century technology. DOE:A to I is a reference for all scholars of Old and Middle English. Directory of Music Faculties is a database of music faculties in colleges and universities in the U.S. and Canada. Foreign Policy offers insight and analysis of global affairs for leaders from government, business, finance, and the academic world. Military Balance Plus (MB+) allows access to wide-ranging data and enables users to customize, view, compare and download data. Data sets are continuously monitored and updated by IISS analysts in the Defense and Military Analysis Program. Translations of the Peking Gazette Online is a comprehensive database of English-language renderings of official edicts and memorials from the Qing dynasty that cover China’s long nineteenth century from the Macartney Mission in 1793 to the abdication of the last emperor in 1912. As the mouthpiece of the government, the Peking Gazette is the authoritative source for information about the Manchu state and its Han subjects as they collectively grappled with imperial decline, re-engaged with the wider world, and began mapping the path to China’s contemporary rise. Wiley Digital Archives is a continuous program of new databases comprised of historical primary sources, digitized from societies, libraries, and archives around the world, and made accessible in ways that tie directly to research outcomes and educational goals. All Archives are cross-searchable, and contain tools for searching, browsing, analyzing and visualizing primary source content. Fewer Clicks and Tabs Between You and Your Items! Delivery, physical item availability information, and request services will be part of the BobCat interface! The update is expected to be complete by mid-morning (EST) on Tuesday, March 5th. We are not anticipating any noticeable downtime. Item details pages get new sections and in-page request and delivery forms. Make requests for items, scans, paging, right from an item’s details page. Find out what’s new in BobCat and share your feedback. We’re always working to improve BobCat. Not seeing results, or having trouble with the interface? Report bugs or issues, or just leave feedback via the “Feedback” button in every item page or on the submenu in BobCat. You can use the “GetIt (Legacy)” feature as an alternative if you experience an issue. Ask a Librarian! Use our chat service in BobCat, or visit the reference or circulation desks at the library. Article updated March 5, 2019. A new display in Dibner Library features Bakelite, the first synthetic plastic and its inventor, Leo Hendrik Baekeland. A Belgian chemist, Baekeland immigrated to the United States in 1889 to do chemical research on photographic paper and eventually patented his new paper under the name ‘Velox’. In 1907, he filed a patent for oxybenzylmethylenglycolanhydride, later called Bakelite, a synthetic thermosetting plastic that could be molded and then cured by applying heat and pressure using a Bakelizer machine. Bakelite was used for a wide range of products from clocks and radios to billiard balls and gears – all of which can be seen in the display. Bakelite jewelry is still popular among collectors, impressive for its resistance to chemicals and wear. The jewelry on display is actually contemporary work made using vintage phenolic rods by the local artist Jorge Caicedo – which just goes to show how remarkable Bakelite is in terms of durability. During its heyday, Bakelite was hailed as the “material of a thousand uses” and advertisements focused on its variety of applications in all sectors of production. Since Bakelite was an excellent electrical insulator, it became widely used in industrial settings and cars, so much so that their modern counterparts are still being used to this day! A variety of these automotive parts and industrial tools are also in the display. The display will be up in the atrium of Dibner Library until July 1st, but you can always find more information about Baekeland and Bakelite at allthingsbakelite.com! Keep an eye out for a screening of the documentary “All Things Bakelite” on PBS, coming soon. The Bakelite display was curated by dual-degree student Zoe Blecher-Cohen (Poly Archives Graduate Assistant) and Lindsay Anderberg (Poly Archivist) with help from donor Hugh Karraker (All Things Bakelite producer). 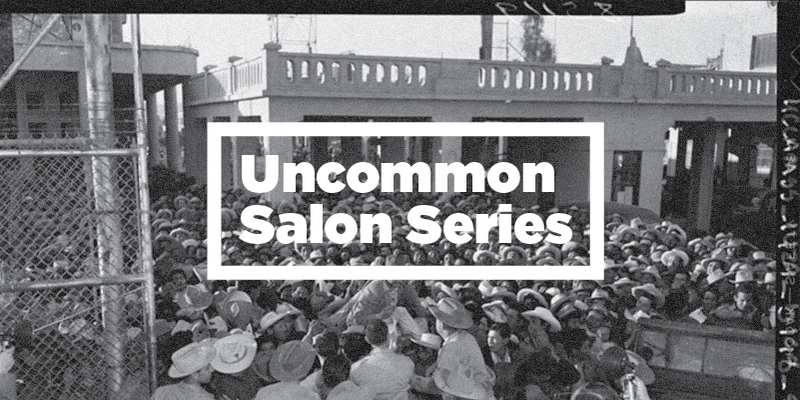 Soon after the first Mexican guest workers started arriving to the US through the Bracero Program, they challenged policy restrictions that prohibited them from organizing unions. As one of the first organizations created to represent these men, “La Alianza de Braceros,” sought to improve the conditions of braceros in both the US and Mexico. This talk explores Alianza’s transnational strategies and the organization’s relationship with the prominent labor activist, Ernesto Galarza. Galarza worked with Alianza to incorporate guest workers into his American unionizing efforts. However, after he grew frustrated with the Mexican government’s repressive treatment of Alianza, he changed his tactics from unionizing braceros to working to end the Bracero Program itself. The subsequent demise of Alianza solidified the growing divide between Mexican and American labor in US agricultural fields. Mireya Loza is an Assistant Professor of Food Studies in the Department of Nutrition and Food Studies. Her areas of research include Latinx History, Social Movements, Labor History and Food Studies. Her book, Defiant Braceros: How Migrant Workers Fought for Racial, Sexual and Political Freedom (UNC Press), examines the Bracero Program and how guest workers negotiated the intricacies of indigeneity, intimacy, and transnational organizing. The New York University Archives is pleased to announce the opening of its latest exhibition. Free and open to the public* during reading room hours. Prepared by ARL/SAA Mosaic Fellow, Jasmine Sykes-Kunk, with assistance from graduate student, Lingyu Wang, features materials from collections held at the New York University Archives. To commemorate the first release of works into the public domain since 1998, this exhibition examines works in the collection that recently moved into the public domain and their relationship to the greater University community. The exhibition features an interactive component and users are encouraged to share their “remixes” using the hashtag, #NYUpublicdomain. To learn more about copyright laws check out the Copyright Research Guide created by NYU’s Scholarly Communication Librarian, April Hathcock. This exhibition is open to the public during Reading Room hours. *Non-NYU visitors, please go to the Library Privileges window in Bobst Lobby to get a visitor pass. The last passes are issued 30 minutes before the reading room closes. The NYU Libraries regularly acquires new databases. Take a look at the new database we added to our collection in January 2019. Armed Conflict Database (ACD) provides monitoring, data and analysis on armed conflicts worldwide, ranging from rebellions and insurgencies to civil wars and inter-state conflicts. Critical Collective is an initiative by art curator and critic Gayatri Sinha. Critical Collective works towards building knowledge of the arts in India. Since its inception in 2011, it has collaborated with institutions in India and abroad to create exhibitions and seminars on art. In order to expand the scale of its activities, Critical Collective created this website. This resource is intended to fill in the lacuna caused by an absence of publishing in the arts, a lack of reprints and a shortage of institutional infrastructure in India to support knowledge in the domain of arts. John Johnson Collection: An Archive of Printed Ephemera provides access to selected items offering insights into the changing nature of everyday life in Britain in the eighteenth, nineteenth and early twentieth centuries. Categories include Nineteenth-Century Entertainment, the Booktrade, Popular Prints, Crimes, Murders and Executions, and Advertising. Royal Anthropological Institute of Great Britain and Ireland (RAI) Archive is a scholarly association dedicated to the furtherance of anthropology (the study of humankind) in its broadest and most inclusive sense. Twentieth Century Religious Thought is a multivolume, cross-searchable online collection that brings together the seminal works and archival materials related to worldwide religious thinkers, from the early 1900s until the turn of the 21st century. Volume I, Christianity includes the complete 17-volume German edition of Dietrich Bonhoeffer Werke (DBW) and English edition of the Dietrich Bonhoeffer Works Series (DBWE). Volume II, Islam focuses on modern Islamic theology and tradition and details Islam’s evolution from the late 19th century by examining printed works and documents by Muslim writers, both non-Western and Western voices. Volume 3: Judaism focuses on modern Jewish theology and philosophy and details Judaism’s evolution from the late 19th century by examining printed works and rare documents. The NYU Libraries regularly acquires new databases. Take a look at the new database we added to our collection in December 2018. CEPR Discussion Papers: Research by CEPR Research Fellows and Affiliates appears initially in the CEPR Discussion Paper series. These Discussion Papers are circulated widely to other specialists in the research and policy community so that the results of the research receive prompt and thorough professional scrutiny. The Centre produces more than 800 Discussion Papers each year and has an archive of over 12,000 of them. Ethnologue: Languages of the World contains data for finding, reading about, and researching all 7,097 known living languages in the world. News, Policy & Politics Magazine Archive (feat. Newsweek): An archival collection comprising the backfiles of 15 major magazines (including the Newsweek archive), spanning areas including current events, international relations, and public policy. These titles offer multiple perspectives on the contemporary contexts of the major events, trends, and interests in these fields throughout the twentieth century. The collection will provide valuable primary source content for researchers in fields ranging from history and political science, through to law and economics. ProQuest Civil War Era is the resource American history scholars have been waiting for–comprehensive primary source materials that were previously unavailable digitally, cover a vast range of topics including the formative economic factors and other forces that led to the abolitionist movement, the 600,000 battle casualties, and the emancipation of nearly 4 million slaves. The Cecil Papers is a major collection of early-modern historical documents from the reigns of Elizabethan I and James I/VI. More than 150,000 pages have been digitised in full colour to create a definitive online archive of almost 30,000 manuscript documents written by some of the most significant figures of Elizabethan and Jacobean history. These are accompanied by the complete Calendar of the Cecil Papers, featuring summaries and/or transcripts of many documents and two eighteenth-century volumes of selected transcriptions. The trench journals and unit magazines of the First World War are a source of information on the common serviceman and woman’s experience of the war. These magazines were written by and for every type of unit from every combatant nation. As such they contain the hitherto unheard voices of hundreds of thousands of men and women writing from every facet of the conflict. We have a wide array of excellent classes and exciting events. Sign up today! And see our FAQs for more information on Libraries services and resources. Subscribe to keep up with our posts!